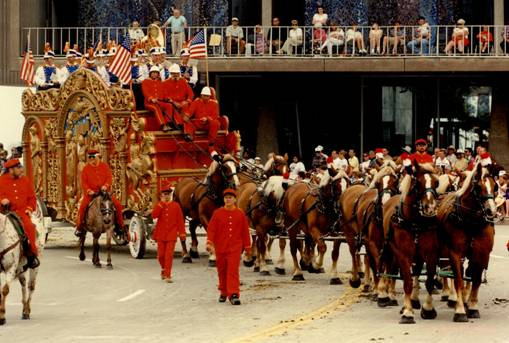 An historic piece of Wisconsin heads to New York for Macy&apos;s annual parade. The Ringling Brothers United States Band Tableau circus wagon is being carefully loaded onto a specially made semi trailer in Baraboo, in preparation for its 1,000 mile journey to the east coast to appear in Macy&apos;s Thanksgiving Day parade . "You know rather than having it just kind of nestled away in Baraboo, Wisconsin, on this very festive day people from all across the world will get to see it." Steve Freese, Executive Director of Circus World, says this priceless, wood-carved, 104-year old vehicle will represent the Badger State in Thursday&apos;s parade, which will be seen by more than 2.5 million people on the streets of New York and another 44 million television viewers. Freese points out, of the wagons that originally paraded in the hay day of the circus, there aren&apos;t too many left. "Many of them, unfortunately, ended up in farm fields turned into chicken coops and coal sheds and some of them just let to go to wrack and ruin. And at the onset of the Second World War when metal was very much sought after from a recycling stand point many of them were set ablaze and salvaged for the metal." The vintage circus wagon was built in 1903 for the Ringling Brothers World&apos;s Greatest Shows. It&apos;s 22 feet long and weighs more than five tons. Freese is thrilled to be a very small part of the 80th running of the Thanksgiving Day parade, which can be seen on NBC. Circus World also owns a collection of over 200 circus wagons and vehicles which account for 2/3rds of the circus wagons known to exist in the world.